TICKETS FOR SALE RIGHT NOW!! This full-day concert is only $10 (kids under 5 free). Learn more about the bands here. The ORIGINAL & Best Tri-Cities Craft Beer Tasting event continues to offer more each year. 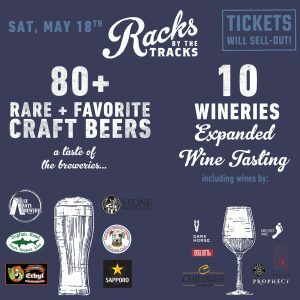 As always, many of the beers at Racks are unique or made specifically by brewers just for Racks festival attendees. The tasting area at Racks is also very unique in that half of it is indoors and half is outside. Your beer tasting ticket also gets you into the concert series. The Craft Beer Tasting Event is from 2pm – 7pm. Every year features old favorites and new finds, and this year should be bigger and better than ever, with 80+ craft beers to sample. Plus, the commemorative sampling glass is yours to keep as part of the ticket price. Just follow the link at the top of the page to purchase your tickets today! One of the biggest announcements for 2019 is the expanded Wine Tasting Event. This year’s event will feature 10 wineries from around the world and over 20 different wines. You will be able to sample something from each type of wine; Red, White, Pink, Bubbly, and more. Operating just like the beer tasting, each ticket will get a commemorative wine tasting glass that will enable attendees to enjoy the basic steps of tasting a new wine; Sight, Smell, and Taste. And for everyone’s enjoyment we have placed the Wine Tasting in the same area as the Craft Beer Tasting, so it makes it easy for attendees of different tasting events to still mix & mingle with each other. 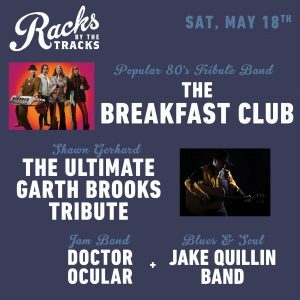 Plus, when you buy your ticket to the Wine Tasting Event you get complimentary admission into the festival’s all-day concerts, which include The Ultimate Garth Brooks Tribute and The Breakfast Club! Kingsport’s Spring WING Fling, sponsored by Eastman Credit Union and VIPSEEN LIVE, is on Friday, May 17th from 5:30-8 p.m. at the Kingsport Farmer’s Market. Attendees will get to sample wings from about a dozen wing vendors from around the Tri-Cities and then vote for the People’s Choice Award. A panel of judges will also judge vendors on various categories. The event will feature a live DJ, beer, wine and other food items. Tickets are $10 prior to the event and $15 on-site. This is a separate ticket from Racks by the Tracks tickets. You can get your Spring WING Fling tickets here.